Volume of export supplies of Russian main battle tank T-90 in 2001-2010 exceeded one thousand units, the report said, "Uralvagonzavod" conducting combat vehicles. According to the company, for the period T-90 tank became the best selling in the world. The biggest buyer of machinery has become India. Adopted Russian T-90 did 20 years ago, in October 1992. The first contract for the supply of three experimental tanks India signed in 1999, and in February 2001 the Indian Ministry of Defense has acquired 310 T-90S tanks. In 2006, India signed a contract for the licensed production of thousands of T-90S tanks, and then entered into an agreement to supply another 330 T-90SA. In total, India plans to increase the number of T-90 in service until two thousand units. Apart from India in 2011, the Ministry of Defense of Azerbaijan has acquired a number of T-90 and details of the transaction were not disclosed. Previously purchased from Russia, Algeria 185 T-90, and in the fall of 2011 has increased the purchase of 120 of these machines. In addition, the machines have already won ten Turkmenistan, and in the summer of 2011 has acquired an additional 30 T-90S tanks. Finally, in 2011, Uganda was given 31 T-90S tanks, bought in 2010. Thus, except for the licensed production of T-90S tanks in India, the export volume of these vehicles was about 870 units, and with the contracts for which delivery has not been completed — 1020 units. In service with Russia are about 620 T-90 tanks of various modifications. 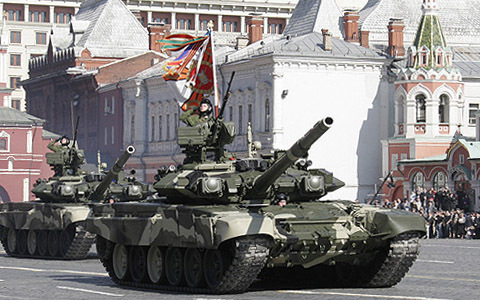 In 2011, the cost of the new T-90 contract for the needs of the Defense Ministry budget is 118 million per unit.